Finally! This long winter seems to be coming to an end and summer is just around the corner. Summer means warmer days, longer evenings and of course barbecues. Some parents are a little leery of barbecuing with small children under foot but with some simple precautions there’s no reason you can’t safely cookout with your children nearby. 1. Be sure to keep the grill away from all structures, siding, deck railings. Be sure your grill is not under the eaves or near low hanging branches and is also a safe distance from any lawn games and areas where your children play. 2. Don’t wear large, loose fitting clothing while you’re grilling. 5. Set up a 3-foot “safe zone” to keep children and pets away from the grilling area. Finally, don’t leave your grill unattended – especially when children are playing nearby. 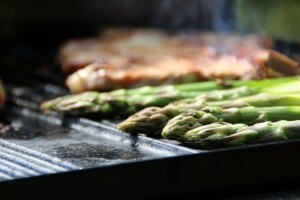 Unattended cooking is the number one cause of accidents and fires when it comes to barbecuing. This list may seem like a lot to remember but once you’re in the habit of following the steps it will become second nature and you and your family will be safe to enjoy the long, lazy days of summer.